- a Family that cares! Located in Riceville, IA, we are a community owned, not-for-profit skilled nursing facility & outpatient skilled rehabilitation and therapy clinic. We have been serving Northern Iowans & Southern Minnesotans since 1972. Our dedicated, professional, staff is committed to the best care of our residents. We strive to obtain our resident's goals; whether short-term or long-term. 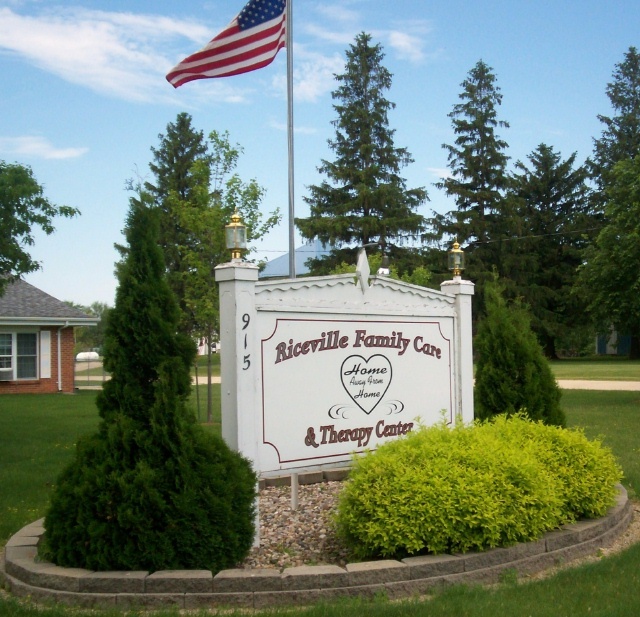 Riceville Family Care & Therapy Center was named the 2009 Winner of the Prestigious Governor's Award for excellence in health care, one of only three facilities to win this award in 2009. In 2010, we were recognized as one of the Best Nursing Homes in America by US News & World Report (Feb 2010 issue). Today, we are a 5-star Nursing Home as rated by the Centers for Medicare and Medicaid Services. Our commitment to excellence and continuous improvement helps us maintain the highest rating possible. Our mission is to provide nursing and medical care for the elderly and disabled population of Riceville and the surrounding service area. Service shall be provided without regard to race, religion, ethnicity, gender or sexual orientation. Our goal is to provide a loving, family atmosphere where our residents are appreciated, cared for, and warmly welcomed into the Riceville Family! Enjoy the small-town, close-knit community with all the services and supports you’d find in a big city facility! Our campus offers a variety of services to fit your needs - both on-site and outpatient. We also offer Congregate Meals for our regional 60+ Club! We invite you to learn more about our facility and the different services we offer by browsing our site or give us a call at 641.985.2606 to set up a personal appointment with one of our staff. Or, stop in and see what makes Riceville Family Care & Therapy Center so amazing for yourself!